Pat the fish dry and season with salt and pepper. Put the flour in a shallow bowl. Dredge the fish in the flour, shaking off the excess. Heat 1 tablespoon each butter and olive oil in a large nonstick skillet over medium-high heat. Add the fish and cook, turning once, until opaque, about 3 minutes per side. Transfer to a plate and cover with foil.Add the garlic to the skillet and cook, stirring, until just golden, about 30 seconds. Remove from the heat and add the wine, lemon zest and lemon juice. Return to the heat and cook, stirring, until the wine is slightly reduced, about 2 minutes. Season with salt and pepper. Meanwhile, toss the greens with 1 tablespoon olive oil, and salt and pepper to taste. Divide the fish among plates. Add the remaining 1 tablespoon butter to the sauce in the skillet and stir until melted. Pour the butter sauce over the fish. Wipe out the skillet. Heat the remaining 1 tablespoon olive oil in the skillet over high heat. Add the capers and parsley and fry until crisp, about 1 minute; sprinkle over the fish. 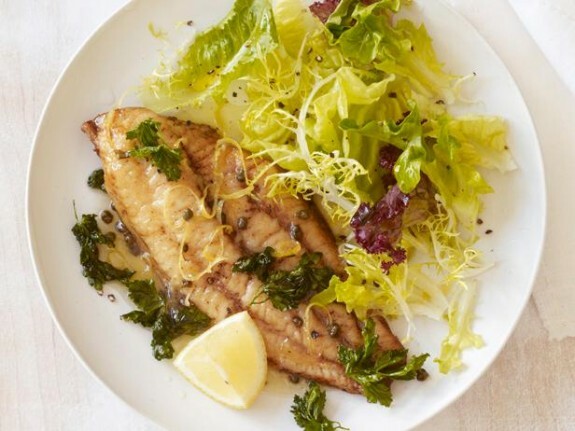 Serve with the salad and lemon wedges.